“Coming Thro’ the Cornfield.” Words and music by Horatio Nicholls (a.k.a. Lawrence Wright). Recorded by Elsie Carlisle with piano accompaniment by Carroll Gibbons on June 21, 1926 at the Gramophone Company’s Studio B at Hayes in Middlesex. Zonophone 2772 mx. Yy8563-2. 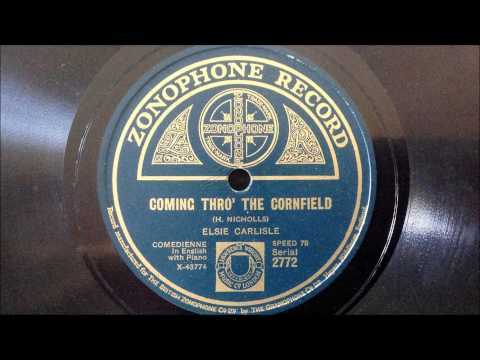 Elsie Carlisle sang “Coming Thro’ the Cornfield” at her second recording session for what was to be her second record, accompanied by pianist Carroll Gibbons, who would soon become the famed director of the Savoy Hotel Orpheans. The song was written by performer, music publisher, impresario, and composer Lawrence Wright, who tended to use the pseudonym “Horatio Nicholls” on his own original compositions. Elsie handles this effusive expression of love in a rustic setting with her usual sweetness, and the pairing with “I Love My Baby” on the other side of the record allows her to adopt the personae of two very different girls in love. “Coming Thro’ the Cornfield” was recorded two days later by the Savoy Havana Band, in late July 1926 by Bert Firman’s Dance Orchestra, and again in late September by Bert Firman’s band (as “Newton Carlisle’s Dance Orchestra” on Homochord and as “Dan Frederick and His Dance Orchestra” on Sterno). “Whisper Sweet.” Words and music by James P. Johnson, Jo Trent, and Horatio Nicholls (a.k.a. Lawrence Wright). Recorded by Elsie Carlisle, probably with the Embassy Rhythm Eight, on February 1, 1935. Decca F. 5436. The names James P. Johnson and Horatio Nicholls (a pseudonym of composer, music publisher, and impresario Lawrence Wright) are well known, that of Jo Trent considerably less so, and the origin of their song “Whisper Sweet” is comparatively obscure. Legendary stride pianist James P. Johnson composed many classic jazz tunes, including the original “Charleston.” Jo Trent was a lyricist who worked with many of the great composers, including Johnson; in 1931, for example, the two of them collaborated on the songs “Fooling Around with Love,” “Hanging Around Yo’ Door,” and “Hot Harlem,” but Trent appears to have avoided the spotlight; it has even been uncertain whether he was a man or a woman (he was the former, it seems: Joseph H. Trent). Lawrence Wright used his own name when publishing and sometimes even writing music, but he used the pseudonym Horatio Nicholls solely on compositions. There is sheet music for “Whisper Sweet” featuring a photograph of Eve Becke that credits Jo Trent and James P. Johnson as having written the words and music, with no mention of “Nicholls” at all (although the music was published by Lawrence Wright and bears that trademark). It might be asked if Lawrence Wright made some contribution to the arrangement that Elsie Carlisle sang. For what it is worth, I can find no fundamental difference between the arrangement that Elsie used and the one used by Bob Howard the next day in New York. As with the flip side “Dancing with My Shadow,” it is assumed that Elsie’s accompanists for “Whisper Sweet” were the Embassy Rhythm Eight, as the matrices of Decca F. 5436 and two recordings that the Rhythm Eight did on February 1 and 5 form an interlacing sequence. “Whisper Sweet” is considerably livelier than “Dancing with My Shadow,” and its theme more upbeat. Elsie’s simple, sweet interpretation is suited to the dreamy lyrics, which focus primarily on the subtle outward signs of the beginning of romantic attraction. 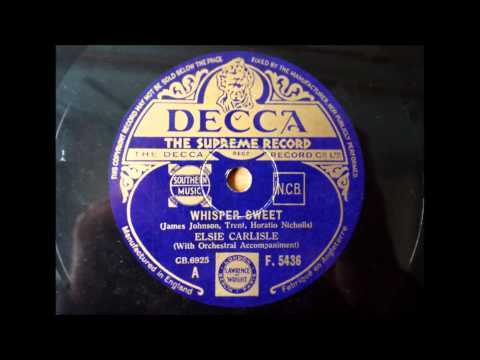 The day after Elsie Carlisle recorded “Whisper Sweet,” Bob Howard and His Orchestra did a version in New York. Later in January there were London recordings by Carroll Gibbons and the Savoy Hotel Orpheans (with singer Brian Lawrance) and by Pat Hyde. In April Valaida Snow sang it for Parlophone, again in London. Sometime that year Eve Becke must have both broadcasted and recorded it, something which is asserted by the cover of the Lawrence Wright sheet music, but I have not identified an actual disc.